December 18th, 2018 – The Memphremagog Watershed Association (MWA) recently received a $4,500 grant from the Vermont Community Foundation's Northeast Kingdom Fund. The grant will help further MWA’s mission of protecting and preserving the environment and natural beauty of the watershed by providing hands-on education for area elementary school classes. 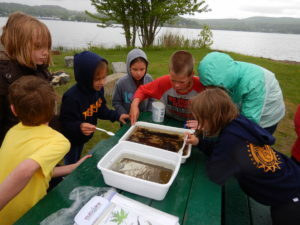 The Youth Discovery Program is an education field trip program for elementary school classes on Lake Memphremagog. Students learn about the watershed, challenges, and conservation solutions. The Northeast Kingdom Fund is a permanent philanthropic resource dedicated to supporting the people and communities of Caledonia, Essex, and Orleans Counties. Its grants are decided by a committee of local Residents, providing philanthropy for the Kingdom, by the Kingdom. The Vermont Community Foundation inspires giving and brings people and resources together to make a difference in Vermont. A family of hundreds of funds and foundations, they provide the advice, investment vehicles, and back-office expertise that make it easy for the people who care about Vermont to find and fund the causes they love. Visit vermontcf.org or call 802-388-3355 for more information.